While I've been injured, I've been thinking a lot about my own running form. Was it my running form that caused this injury? How do I improve it? What do I need to do better? Should I have Ward video tape me? Where do I send it? Should I hire a coach? Man, I really want a coach. Darn daycare expenses. I want to have the perfect running form. When I am spectating races, especially big ones like the Boston Marathon, I am in awe watching the form of the elite and masters runners. In this picture Wade is giving me advice. How to hold my hands and not tense my fingers. If I'm going to run with the guys, I better be ready for advice. I would really love to attend a running form clinic. When I'm running with Ward and he starts to correct me, and I get frustrated: Lean forward, arms down. Will I be frustrated with someone else critiquing my running form? Probably not. Last week I made a visit to an Athletic Trainer, and he analyzed my walking gait and running. We talked about my shoes, how they wear, what shoes are best for me, and how I should focus on landing. We also talked about cadence and how to improve my cadence by shortening my stride. All good things. That entire experience was amazing. I gained an incredible amount of knowledge from Bob. I left there really wanting to learn more about my form and how to be a better runner. Have you ever been to a running clinic? How about an Athletic Trainer? 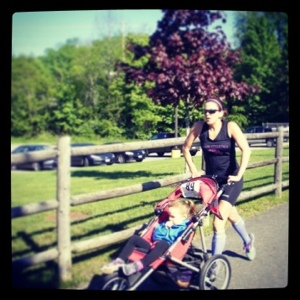 Do you have a running coach? I have never done any of the above would definitely like to some day. Form is so important and I try to focus on it while I am running. Glad you had the chance to experience an Athletic Trainer. Sounds like something we can all benefit from. I'm really kinda "anti gait retraining guy" as I don't believe in "perfect form". As anyone has ever watched the finish line of a major marathon... nobody looks exactly the same, Kenyans heel strike, midfoot strike and forefoot strike. Joan Benoit looks like complete crap when she runs... her form is nowhere near perfect, yet it is extremely efficient for her body. My take, is that the more you run, the more your body adapts and finds it's own most efficient way to be a faster, injury free runner. The only valid point about cadence to me, is making sure you are not OVER-striding. This has nothing to do with landing on your heel, midfoot or forefoot... and it sure as heck has nothing to do with heel/toe drop in shoes. It's about landing within yourself... and again, the more you run and the less runners worry about form, the better they will be. Form is something I think about a lot! I feel as if I have a lot of room for improvement in that area….whenever I see pictures of myself running, I cringe. I would love to see an Athletic Trainer or get the kind of feedback you got - that sounds awesome. Overall I think it's good to focus on and try to improve, but at the same time, I think form is something that is individual to everyone too. I've never done any of that, and as of right now I don't really feel the need to. I changed my running form in the first few months of running on my own and found what works for me. I hope that this helps you in the future though! I think about my form often - especially in light of injuries. I know that form can play a role in injuries (and prevention). But man it can be hard to change. My husband actually bought several books and even a DVD years back to change his form. He used to have horrible issues with shin splints. Now...not at all. I think about my running form a lot, but since I cannot see myself...I have no idea what it looks like. My husband is very kind when he gives me advice, but it is probably harder to take from someone so close. How did you find an athletic trainer? I would be interested in hearing what they think. 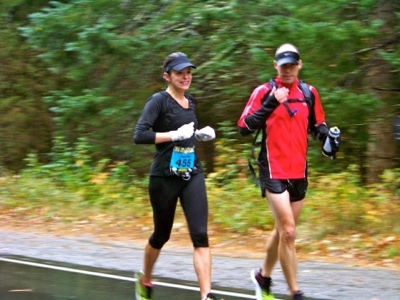 I do run with a coached group, which was one of the best things I ever did for my running. This season I've been struggling with a pace plateau and feeling like I couldn't get any speed at the end of a race or hard workout. The tipping point was seeing a picture of myself at the finish of a recent race - I looked like I was about to sit down! If I was driving a car, I would be driving from the backseat. This weekend I somewhat hesitantly attended the Gait Clinic at Maine Running Company in Portland. I say that I was hesitant because I am an athletic trainer who has spent thousands of hours studying running mechanics and now works in the physical therapy setting. However, the cerebral knowledge of gait doesn't translate easily when you're working on your own body. It was a gamble if I would learn any new tricks. The clinic included video review of your gait and several experiential exercises to learn how some simple modifications could make you into a more efficient runner. I could not be happier with what I learned at the clinic about how I run and it certainly empowered me with what I need to improve myself. Seeing yourself on video is a powerful tool (and it only cost $15!). I think that everyone has a natural form that fits their body, but there are certainly little tweaks that can be made to be the most efficient you can be. When I hurdled in high school/college, I would alternate my lead leg going over the hurdle which means I took 4 steps in between. Most (including the pros) take only 3 steps. I was finally able to run them with 3 steps, but it actually made me slower because I had to overstride. So of course I went back to the way my body found it to be the most efficient. From photos and video, I feel that I twist my torso too much when I run and need to relax my arms a bit. I think it would be cool to have a professional look at my form and provide me with some things to be mindful of. We should have our own little Rail Trail Chick clinic and video all of us running. Just don't show the husbands. Ha ha! I'm always thinking of my form! It's a good thing to be conscious of, especially on long runs! Allan helps me with my form. I've never had anyone professional give me tips but that would be nice.